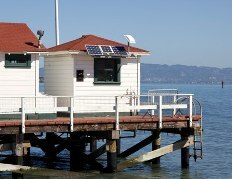 Federal officials this week launched a new climate change research center, designed to be a hub for studies on the impacts of climate change on the San Francisco Bay and coastline. The tidal gauge off of San Francisco's Fort Point is the oldest in North America. The Ocean Climate Center is housed in a collection of century-old military buildings on the edge of the Bay at Crissy Field. It couldn’t be a more picturesque — and critical — location. Adjacent to the oldest tidal gauge in North America, the center will allow cash-strapped federal agencies to pool resources into climate change research and work with natural resource managers to combat negative impacts on the marine ecosystem and communities along the coastline. DeWayne Cecil of the National Oceanic and Atmospheric Administration (NOAA) said the center is a first-of-its-kind collaboration among federal agencies on the West Coast, including NOAA, the Department of Interior parks and marine fisheries services, and the US Geological Survey (USGS). Patrick Barnard, a coastal geologist with USGS, said the center was located in San Francisco because of the degree of scientific research already underway here. The center’s reach will stretch across the Gulf of the Farallones National Marine Sanctuary, from the Farrallon Islands to Suisun Bay and along the coastline up to Point Reyes. A $100 million research grant has been designated for the first joint project to study sea level rise and storms along the coast and the communities most vulnerable. Barnard said the results of the two-year study will be translated into tools for community planning. The center will also be hosting real-time “webinars” for the public to ask questions of scientists. A separate visitors’ center is planned to open in a few years, to explain how the changing climate will affect the Bay Area. Alison Hawkes is a San Francisco-based environmental journalist and co-founder of the Way Out West News website.